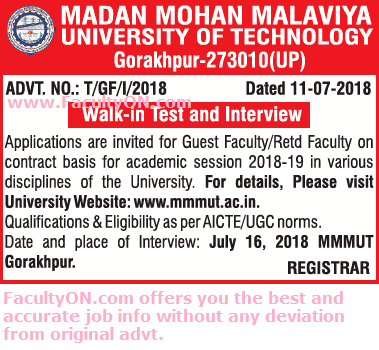 Madan Mohan Malaviya University of Technology, Gorakhpur has advertised in THE TIMES OF INDIA newspaper for the recruitment of Guest Faculty / Retired Faculty jobs vacancies. Interested and eligible job aspirants are requested to walk-in on 16th July 2018. Check out further more details below. College Profile: Madan Mohan Malaviya University of Technology, Gorakhpur has been established in year 2013 by the Government of Uttar Pradesh in the form of a non-affiliating, teaching and research University after reconstituting the Madan Mohan Malaviya Engineering College, Gorakhpur which was established in 1962. How to Apply: Interested and eligible candidates should appear for interview along with their duly filled in and signed application form available on University website along with DD of Rs.1000/- in favor of Controller of Finance, MMM University of Technology, Gorakhpur 273010 payable at SBI , M.M.M Engineering College Branch, Gorakhpur. You are required to report on walk-in date an half an hour before the time of commencement of interview along with original documents and on set of attested copies of degree, mark sheets, experience certificates.